Poincare public beach is east of Magnan and west of Florida Beach. The beach is rather narrow at the western end but widens nicely towards the east. The high rocks separating the beach from the Promenade help keep the traffic noise down. There are two family-run hotels that look out onto Poincare beach. Both are set back from the Promenade so you're protected from the noise. 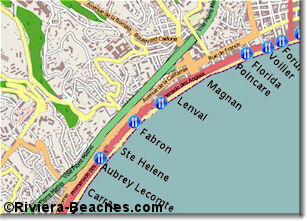 Try Villa Eden or Hotel Flots d'Azur. There's a lifeguard on this beach from June to September. See more about lifeguards. There's very limited hourly parking on the Promenade des Anglais but it's inadvisable to come here by car. There's a portable WC in the summer and a WC in the Avia service station across the Promenade. The closest bus stop is Magnan/Promenade bus stop a hundred meters or so west at Magnan. You'll find buses 8, 11, 52, 59, 60, 70, 94, 98, 200, 230, 400, 500. See more on buses in Nice. You'll have the widest choice in the Magnan neighborhood where there's a cafe, a supermarket and snacks places. You can also pick up necessities in the Avia service station across the Promenade.